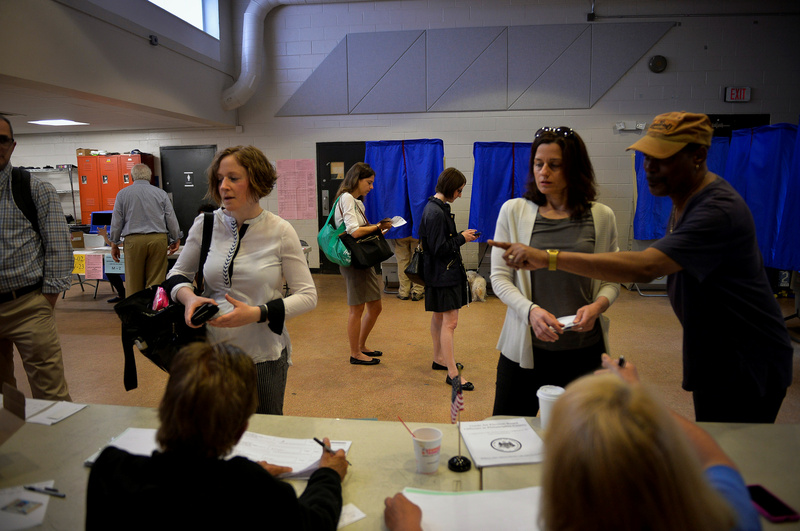 Voters in five states -- Connecticut, Delaware, Maryland, Pennsylvania, Rhode Island -- will show up to polling sites Tuesday to cast votes for their preferred candidate in the Democratic or Republican races for president. It's the final primary day of April. Voters can choose either Hillary Clinton or Bernie Sanders on the Democratic ballot. Donald Trump, Ted Cruz and John Kasich are the candidates on the Republican ballot. Polls in four of the states -- Delaware, Maryland, Pennsylvania and Rhode Island -- will be open from 7 a.m. to 8 p.m. ET. Polls in Connecticut will be open from 6 a.m. to 8 p.m. ET. All of the states except Rhode Island operate under a closed primary system in which only registered Democrats and Republicans can cast ballots in their respective party's primary. Rhode Island has a semi-closed primary in which the closed primary rule applies but if voters are registered as "unaffiliated," they can vote in the primary of any party they choose. If that happens, that automatically enrolls them in that particular political party. Meanwhile, a total of 419 delegates are at stake in the Democratic race and they are distributed proportionally except for 10 in Maryland who are pledged party leaders or elected officials. Recent polls in each of the five states show Clinton leading Sanders, and Trump leading both Cruz and Kasich. This primary comes one week after Clinton's and Trump's victories in New York. A CBS News/YouGov Battleground tracker poll released Sunday found Clinton is leading Sanders 51 percent to 43 percent in Pennsylvania where Trump leads Cruz and Kasich by as many as 23 percentage points. The poll also found Trump and Clinton lead in Indiana, which holds its primary next Tuesday. According to CBS News' latest count, Trump has picked up 844 delegates, Cruz has 555 and Kasich has 147 -- fewer than those awarded to Marco Rubio. A candidate needs 1,237 delegates in order to win the GOP nomination. Clinton leads with 1,927 delegates and Sanders has 1,172 in the Democratic race, which includes superdelegates. A candidate needs 2,383 delegates in order to win the nomination. But even as Trump maintains his lead, Cruz and Kasich have decided to team up to try to stop Trump from reaching the required delegate threshold for the nomination. Trump blasted their plan, calling it "a crooked game" and the result of a "rigged system." This comes as Trump's campaign continues to undergo a restructuring to prepare him for the convention and potentially the general election. His campaign aides say Trump is shifting his approach as a candidate as the July convention in Cleveland nears. On Monday, Clinton released a new "Love and Kindness" ad in an effort to present a message of unity as she shifts her primary campaign into general election mode. Over the weekend, Sanders' senior adviser Tad Devine said the campaign could "re-evaluate" the senator's tone toward Clinton depending on the outcome of Tuesday's contests. CBS News' Catherine Cannon, Katiana Krawchenko and Donald Judd contributed to this report.